"We really enjoyed everyone that worked with both of our kids! You guys did a great job and I am so glad we chose to use you guys...A great decision and worth the 30-minute drive!" As your child grows, their teeth will go through many stages of development that will have an impact on their dental health for the rest of their life. It is important to ensure that their teeth are healthy and developing properly, which will give them a very healthy future. At Hines Little Smiles, Dr. Hines, Dr. Anderson, Dr. Norman and Dr. Pagé their staff specialize in pediatric dentistry in Columbus, Ohio. We can assist in your child’s development and ensure their smile stays bright and healthy throughout their entire life. Young children need dental care from the moment their first teeth erupt. 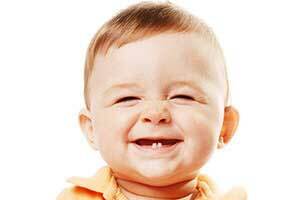 Normally an infant’s first tooth will start to push through their gums when a baby is between 6 and 12 months old. Young children need dental care from the moment their teeth start to erupt. Come in to Hines Little Smiles for an initial exam as soon as their first few teeth begin to appear. We can evaluate their teeth and help ensure that they are developing properly. and that the teeth are getting all the nutrients they need. We’ll also teach you how to care for their teeth properly and your child will be healthy and smiling for the first few years of their life. Their gums will very tender and sore as these first baby teeth come in. Letting a baby bite on a cool wet cloth or using teething rings/toys can often help soothe their gums. When your baby’s first teeth emerge, don’t leave a bottle in their mouth while they sleep. The milk or formula left on your baby’s teeth for extended periods of time can lead to tooth decay. One of the main functions of baby teeth is to hold a space for the adult teeth which will grow in later. As your child gets older, we can monitor their bite to confirm that everything stays in proper shape. Preventing cavities and premature tooth loss is a major step in keeping you child’s smile healthy and preparing for their adult teeth. We offer regular cleanings to help keep plaque away. Once your child’s baby teeth start to fall out, their permanent teeth begin to emerge. This is an important time in their dental development, as these are the teeth they’ll keep for the rest of their life. We can keep an eye on these emerging teeth to make sure they’re straight and strong and address any problems early on. We also offer dental sealants when your child’s molars come in. Dental sealants protect the chewing surfaces where most tooth decay starts, and have been proven to significantly reduce the likelihood of cavities. With proper preventive care, your child’s teeth can stay bright for a lifetime! Your child needs regular dental visits to ensure their teeth stay healthy. Call today to schedule your child’s next checkup. You can also make an appointment online through our Request an Appointment page.Monitoring your child’s growth and development is important to ensuring your child grows up to be healthy and strong. Call today to request an appointment for your child.